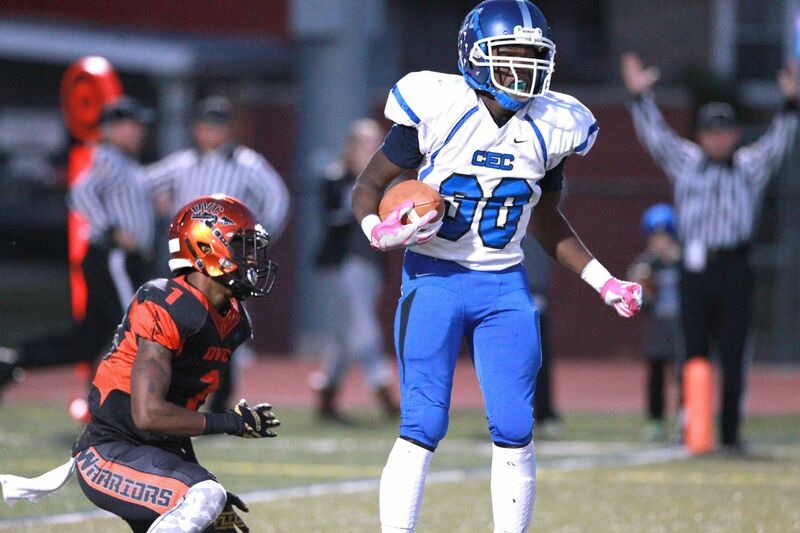 Terome Mitchell, right, shown here in a game last season, had a big offensive night for Conwell-Egan. Saturday night at Truman was pick-your-poison night as Conwell-Egan seniors Patrick Garwo and Terome Mitchell took turns punishing Roman Catholic en route to a 38-20 victory. Mitchell dominated early, and Garwo, a Boston College recruit, closed the Catholic League proceedings in style. By intermission, Mitchell had a 56-yard touchdown run, an 80-yard punt return and a 16-yard touchdown reception. Nicknamed "Tre," Mitchell finished with 101 rushing yards on 10 carries and 41 receiving yards on 2 catches. Mitchell also added a late sack. Garwo finished with 178 yards on 15 carries and 2 tallies. His 66-yard touchdown near the end of the third quarter was equal parts powerful and electrifying. The Eagles (1-0) led 18-7 at the half and 38-7 after Garwo's 66-yard jaunt in the third quarter. Roman (0-1) responded valiantly, scoring 13 points in the final frame. The Cahillites best play happened fortuitously after Ryhme Robinson's pass deflected off a teammate and fell into the arms of fellow sophomore Ivan Thorpe, who scored from 71 yards out.